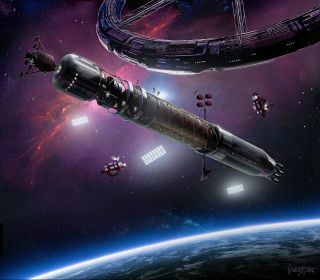 An interplanetary rocket visits a rotating-wheel space station in this artist's illustration put out by the proposed space-based nation Asgardia. The interior of a space colony as visualized for the space-based nation Asgardia. Asgardia's first satellite, Asgardia-1, will launch in September from Orbital ATK's Cygnus spacecraft, which will be bringing supplies to the International Space Station.